A hugely enjoyable addition to the world of Eorzea with plenty of room to spread your wings and explore. What is it? The first expansion of the formerly troubled, but now excellent, MMO. There are a lot of expectations to live up to when your game bears the Final Fantasy name. They all need to have epic, twisting storylines, magical landscapes, and plenty of Moogles. It’s all part of the the series’ DNA. But despite possessing all of these things many still don’t consider the MMOs of the collection to be ‘proper’ Final Fantasy games. Those people are missing out. FFXIV has long balanced the trappings of a traditional Final Fantasy game with the demands of the MMO format to great success (let’s forget about its very first iteration; A Realm Reborn erased all of that bad blood long ago). Its first expansion, Heavensward, adds a huge new section to the map of Eorzea, the power of flight and several new classes without tipping those finally balanced scales. Where TESO fails to marry the expectations of single-player Skyrim with a world filled with other people, FFXIV and its expansion succeed. Taking you into the heart of the once sealed-off city of Ishgard, Heavensward opens on a solemn note. Given the pre-expansion revelations in the city of Ul’Dah that saw your friends in dire straits, it’s a fittingly frosty start, but to see it you’ll have to have complete the main questline of A Realm Reborn and all of its subsequent patches first. It will take you a while if you’re starting as a completely new player, but the journey is well worth it, and boosts can help first timers level-up quickly and cut dungeon queue times. Unless you really want to play as the new scaley Au Ra race, you can wait until you’re ready before spending your cents on Heavensward. The new areas are vast and designed to take full advantage of the new flying mounts. Camps pepper the snow-besieged hills of Western Coerthas, while the Sea of Clouds swims with tiny Islands waiting to be explored. It’s a real shame that you can’t take advantage of that flight-based design straight away though. You’re stuck on foot until you unlock all of the aether currents in any given area to ‘learn’ what the surrounding winds are like. Some are dotted around the hills and obscure high points, while others are unlocked during quests. 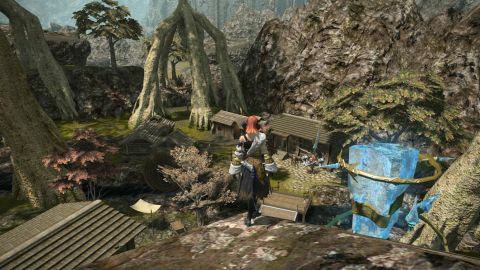 It does start to feel dull as you run from one end of the map to the other doing classic MMO busywork—slaying five Bandersnatches here, setting three chocobo traps there—but once you get them all and you finally take flight all of that tedium is forgotten. Taking to the skies is glorious: the trees of the Chocobo forest and the fluorescent pompoms of the Churning Mists make for splendid spectacle. Flying makes even the most mundane of delivery quests a real joy. The fighting is equally grand. The new classes—gun-toting Machinist, sword-wielding Dark Knight and globe-spinning Astrologian—add a nice mix to party line-ups, as do the new skills for the existing classes that accompany the level cap rise to 60. With every new move comes a new layer of strategy to consider. While many players are still finding their feet over what works best in any given situation, it’s the newfound sense of greater choice that’s most exhilarating. Currently Dark Knights, with their ability to heroically leap ahead into battle, seem to be winning in the popularity stakes. I don’t tend to play defensive classes, but I can see the appeal of swinging a greatsword in people’s faces, dark magic emanating from my body in a weirdly stylish fashion. Instances have gone from bare-bones ‘punch the boss until it falls over before getting the next bit of story’ affairs, to multi-part stages filled with tension and purpose. Early on in the Heavensward story you return to the dungeons of halatali for a rescue mission (no spoilers), but instead of having to face the full gamut of obstacles, a section of it has been cordoned off and filled with new challenges for you and your AI partners to complete. It’s a simple but effective twist, that gives all of your sword-swinging actions a greater sense of impact on the story. The new dungeons are all welcome additions, each adding further environmental twists. Instead of smacking mobs into submission and then moving on, there are now dragons changing the field with their burning breath, or secret passageways hidden behind bookshelves to contend with. It’s the little changes like this to an already successful formula that keep the new dungeons fresh. There’s a lot on offer here, and while I sunk over 40 hours into the main story line I have yet to see the end of it. The amount of new things to do on offer is equal to that of the base game, which is a huge feat for an expansion, and there’s still plenty more on the way. The new Alexander Raid is yet to be added, and substantial updates have been promised further along the line to keep adding to the story. If you already play FFXIV then Heavensward gives you even more of what you know and love. For those that have been eyeing up those chocobos from the sidelines, well, there’s no escaping the catching up you’ll have to do, but that shouldn’t put you off. The base game has changed a lot over the last year and has effectively transformed itself into the ultimate Final Fantasy themepark. Even if you don’t know your Tonberrys from your Cactuars it’s well worth playing for the sheer variety of adventures on offer. Now is definitely the time to get involved.